Download the digital version of the Streaming Media Sourcebook now! Subscribe now to be on the list to get it in print next year. In this year's Streaming Media Industry Directory you'll find premium vendors offering products and services to serve your needs for Online Video. 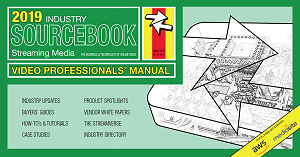 Vendors listed here also appear in the Streaming Media magazine's annual Industry Sourcebook. If you would like to be listed in the Sourcebook, please click here. There are two ways to access the information in the Sourcebook: click on a vendor logo in the list below, linking directly to a detailed page containing information about that company, its products, solutions and contact information; OR select one of the categories from the for a list of corresponding solution providers. To review companies that provide products and services - pick the category from the Products/Services list. To review companies that supply to a specific vertical industry in which your company participates, pick from the Industry Verticals list.